Good Morning and thank you for joining us bright and early every weekday at 8am! Starting your morning, #ThatBusinessShow works to promote our local community, inviting local professionals to come on the #MorningAir and promote their businesses and to spread a positive message to the community! If you want to come on the #MorningAir, head to http://www.tampabayradio.com and leave us a message and maybe you can get on a #MorningWithMeloni! Today on the show, we welcomed Andrew Gold and Jeff Gerard! 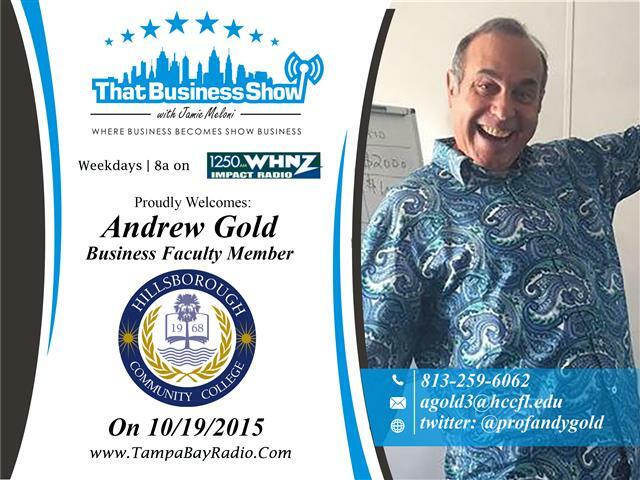 Andrew Gold, Ph.D. is a Serial Entrepreneur and a Professor at Hillsborough Community College and the University of South Florida and the University of Tampa! Also joining us on the #MorningAir was Jeff Gerard, founder of Simon’s Soldiers Foundation, a non-profit employing veterans training homeless canines to be Emotional Support Buddy Dogs for Military Veterans disabled by PTSD. He is also the executive producer for Gerard Films. If you missed today’s episode of #ThatBusinessShow on #1250WHNZ at 8am, then head to http://www.tampabayradio.com or Jamie’s YouTube channel at http://www.youtube.com/jamiemeloni to listen to any show on demand! Coming up first on the #MorningAir with our Host, Jamie Meloni was Andrew Gold, Ph.D.! Andrew is a Serial Entrepreneur and a Professor at Hillsborough Community College and the University of South Florida and the University of Tampa. A New York Native, Andrew spoke to us about the origins of his passion for business, learning at a young age the stock market trade, he eventually made his way to becoming an entrepreneur by wanting to help non profits with their technology needs! Fast forwarding a few years, and today he is a Professor at three Universities here in the Tampa Bay Areas! His core areas of research interest include using social entrepreneurship to reach at-risk students, the effects of moral suasion on academic dishonesty, and the lean startup methodology and its effect on entrepreneurial venture success. He wants to let our listeners know about the Entrepreneurship program at Hillsborough Community College, which helps students understand the processes of founding, owning, and operating their own businesses with hands on experience! You can learn more about the program and Andrew Gold, Ph.D. at http://www.hccfl.edu/! 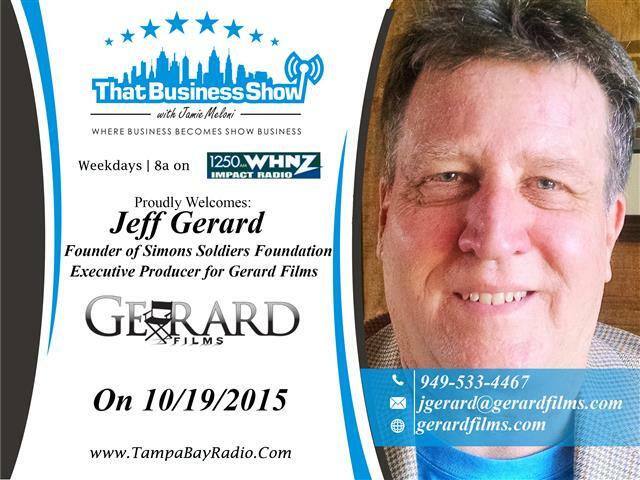 Coming on next on #ThatBusinessShow with Jamie Meloni was Jeff Gerard, founder of Simon’s Soldiers Foundation, a non-profit employing veterans training homeless canines to be Emotional Support Buddy Dogs for Military Veterans disabled by PTSD; and is also the executive producer for Gerard Films. Passionate about our nation’s veterans, through Gerard Films, he created a “Rockumentary” about WWII for younger people to understand one of the most pivotal events in the world’s history in a creative and engaging way. Through Simon’s Soldiers, Jeff has helped many Veterans with PTSD and other ailments get the support they need from trained Buddy Dogs which are proven to lessen the symptoms of many disorders which plague veterans returning from combat. Doing great work for our community, please consider helping Simon’s Soldiers at www.simonssoldiers.org. If you missed Jeff Gerard on #ThatBusinessShow, head to http://www.tampabayradio.com!